During our annual trip every summer to the Ithaca/Watkins Glen area, we always look forward to eating some Emmy’s Organics Macaroons. We usually pick them up at the Green Star Natural Foods Co-op. These little treats come in lots of flavors: Chai Spice, Chocolate Chili, Chocolate Orange, Coconut Vanilla, Dark Cacao, Lemon Ginger, Mint Chip, Mocha, Coconut Vanilla Chocolate Dipped, Dark Cacao Chocolate Dipped, and Chocolate Chip. It’s tough to pick a favorite – it really depends on our moods and what we’re eating them with. If you have a hot cup of tea, Lemon Ginger, Chai Spice and Coconut Vanilla are perfect. But if you love chocolate like the Dirty Hippie, you’ve got the hook-up with Chocolate Chili, Chocolate Orange, Dark Cacao, Mocha and Chocolate Chip. We have no problem at all sitting down to eat and finishing two or three bags in one sitting. Emmy’s macaroons are delicious: flavorful and tender; sweet but not too sweet; wholesome but without tasting like health food. 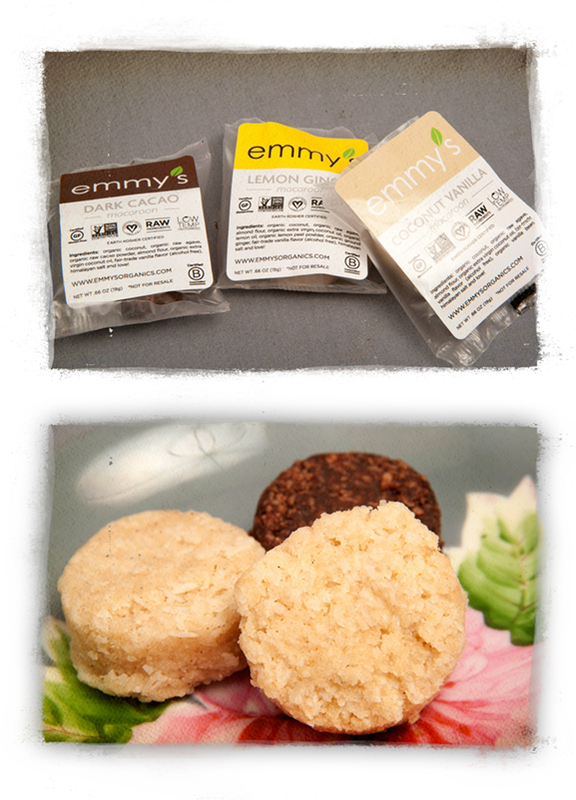 Yup – we look forward to Emmy’s macaroons every summer – so imagine how excited we were to see Emmy’s Organics with a huge display at EXPO – there were piles of her delicious macaroons (all are raw, vegan and gluten-free)! But there was so much more ~ superfood cereals, chocolate sauce and fudge, as well as mini-macaroons and chocolate-dipped macaroons. The line from Emmy’s has really grown! The company is named after co-founder Ian’s mom, Emmy. It was in Emmy’s kitchen that Ian and Samantha(the other co-founder) started cooking together after they met in 2008. This adorable 20-something couple both shared a passion for raw food, healthy eating and natural wellness. When they made Ian’s macaroon recipe together one night, they knew by the next morning they wanted to go into business and sell their coconut treats. We’re so glad they did!! Cuz these macaroons are darn delicious!! Emmy’s Organic Macaroons are already available at locations all over the country. Just use the store locator online to find a retailer near you. All of the products are also available online via Emmy’s website. Oh – Samantha also keeps a blog we love – try her recipe for Mini Pumpkin Pies with Chai Spice Macaroons, or adorable Macaroon Ice Cream Sandwiches.